The DAIWA D-VEC tent can be set up and dismantled in in only a few minutes and thus is the perfect tent for every fisherman, who likes to spend the night at the water. The size of 215x215x145cm offers enough space for a big bedchair and many accessories being stored inside. The robust floor can be removed via loop and hook fastener and thus be cleaned easily. The tent additionally offers a 3-layer door – thus you have the choice between closing the tent completely, only via mosquito net or with an observation window. 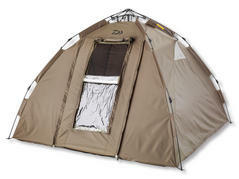 To light the tent, two additional small windows are placed at the sides. A ventilation opening is installed at the backside to prevent waterlogging at the inside. The DAIWA D-VEC Wavelock umbrella with 2.5m is extremely robust and offers enduring rain protection thanks to its thick and strong wavelock material. All seams have been stitched twice and taped afterwards – thus water entry via the seams is prevented even at very strong rain. 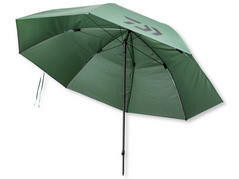 If you are looking for a very strong and safe umbrella, the DAIWA Wavelock umbrella is the perfect choice.